This classic New England home is located on the private and quiet Davis Point, Cushing. With panoramic views of the ocean from each window, this home will soon be a favorite in our inventory. The lower level has an open concept from the large kitchen and island leading into the dining room with a table to seat up to 12 people with additional leaf sections, continuing into the comfortable sitting area with large windows to watch the passing boat traffic and seal sighting. Enjoy breathtaking sunsets while playing board games or bar-b-queing on the deck easily accessible off the kitchen. The two king bedrooms and separate bathrooms allow space enough for a large party to have comfortable privacy but feel home. Upstairs has a large king master bedroom with windows facing north, south, and west as well as a private balcony to enjoy the ever cooling sea breeze. The large front lawn leads down to a pebbly beach which is great for launching kayaks, picnics, and swimming. There are also many tidepools at low tide which are great for kids exploring sea life and sea glass hunting. There is also a deep water dock on the opposite side of the property as well as a deep water mooring for boats - please inquire if interested in bringing a boat. 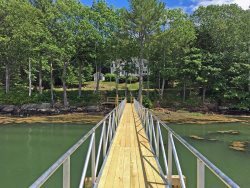 Located conveniently in the Midcoast area, the Davis Point Cottage is a destination for sea lovers and anyone wanting a relaxing and serene vacation getaway. The large property allows space for the kids to play and explore while the adults enjoy a beverage on the deck with everyone in clear sight. The pebbly beach is ideal for kids activities and sunrise runs or sunset walks while beachcombing. The large trees provide needed afternoon shade while the breeze off the St. George River is constantly circulating air flow. Watch passing lobster boats throughout the day and the open Atlantic traffic of tankers, sail boats, and schooners. Cushing is centrally located along the coastline providing a haven to return to after day trips and exploring Maine's beautiful coastline. For basic grocery needs, Wallace's Market is located 10 minutes away in Friendship. Heading south, Davis Point Cottage is located 25 minutes to Waldoboro which does have a Hannaford, 40 minutes to Damariscotta, 1 hour to Boothbay Harbor, and 2 hours to Portland. Continuing north, downtown Camden is 40 minutes away with great dining options, schooner rides, and grocery shopping. Rockland and South Thomaston are only 30 minutes away for more shopping options, and 2 and 1/2 hours to Bar Harbor for great day trips and a lovely scenic coastal ride up Route 1. Cleaning: The property will be cleaned before and after the rental. Above normal cleaning charges will be billed to guest at an hourly rate. Usable Fireplace: Yes, the living room fireplace is the only usable fireplace. The kitchen is not usable. Dock Access: Yes, deep water pier and boat dock (with swim ladder), please note, there is 2' of water at low tide at the dock.